An aircraft carrier is a military ship whose main function is to deploy and recover aircraft. They are generally deployed as part of a carrier battle group which allows a nation to project power great distances without having to depend on local bases for land-based aircraft. Aircraft carriers are generally the largest ships operated by navies; a Nimitz class carrier powered by two nuclear reactors and four steam turbines is over 1,000 feet long and costs about $4.5 billion. Aircraft carriers have two basic configurations. The most common has a flat top deck that serves as a take off and landing area for airplanes. A steam-powered catapult accelerates an aircraft under full throttle, from 0 to 165 mph in 2 seconds during take-off to help it reach take-off speed. To land on the carrier, incoming airplanes moving at 150 mph are equipped with tailhooks to engage one of up to four arresting cables stretched across the deck, stopping the aircraft within 320 feet after engaging a cable. The second configuration, not used by the United States but common among other countries, has a 'ski-jump' at one end of the flat deck, that helps launch the aircraft. This arrangement is designed for use with VTOL or STOVL aircraft that are able to take-off and land with little or no forward movement. These aircraft do not require catapult facilities or arrestor cables to be deployed across the flight deck. In either case the ship steams at up to 30 knots straight into the wind during take-off and landing operations in order to increase the apparent wind speed, thereby reducing the ground speed the plane needs to achieve. Aircraft carriers are generally accompanied by a number of other ships, to provide protection for the relatively unwieldy carrier, to carry supplies, and to provide additional offensive capabilities. This is often termed a battle group or carrier group, sometimes a carrier battle group. The Bridge is the primary control position for every ship when the ship is underway, and the place where all orders and commands affecting the ship, her movements, and routine originate. An Officer of the Deck (OOD) is always on the bridge when the ship is underway. Each OOD stands a four-hour watch and is the officer designated by the Commanding Officer (CO) to be in charge of the ship. The OOD is responsible for the safety and operation of the ship, including navigation, ship handling, communications, routine tests and inspections, reports, supervision of the watch team, and carrying out the Plan of the Day. Also on the bridge are the helmsman who steers the ship, and the lee helmsman who operates the engine order control, telling the engineroom how what speed to make. There are also lookouts, and the Boatswains Mate of the Watch (BMOW) who supervises the helsman, lee helmsman, and lookouts. The Quartermaster of the Watch assists the OOD in navigation, reports all changes in weather, temperature and barometer readings, and keeps the ship's log. The Combat Direction Center (CDC) is the ship's eyes and ears, with computer-enhanced air detection systems. Four warfare modules in CDC compile specific data and relay it to the Tactical Action Officer (TAO) where it is displayed in real time on large computer screens. The TAO uses this information to assist the Captain in defending the ship against attack and employ the air wing on offensive missions. Primary Flight Control ("Pri-Fly") is the control tower for the flight operations on the carrier. Here, the "Air Boss" controls the takeoffs, landings, those aircraft in the air near the ship, and the movement of planes on the flight deck, which itself resembles a well-choreographed ballet. The primary function of the Hangar Bay is to store and serve as a repair area for the ship's aircraft. Nearly half of the 75 aircraft on board can be kept in the Hangar Bay, with the remainder staged on the Flight Deck. Aircraft are lifted from the Hangar Bay to the Flight Deck by one of the ship's aircraft elevators. Each of the four deck edge elevators can lift two aircraft from the cavernous hangar bay to the 4.5-acre flight deck in seconds. The flight deck crew can launch two aircraft and land one every 37 seconds in daylight, and one per minute at night. The Flight Deck is often described as one of the most dangerous places in the world because of the numerous high-performance aircraft launching and landing in a relatively small, confined area. From its four catapults, an aircraft carrier can launch an aircraft every 20 seconds. The catapults are about 300 feet long and consist of a large piston underneath the deck. Above the deck, only a small device engages the aircraft nose gear. The catapult has two rows of slotted, cylindrical piping in the trough beneath the flight deck. When the planes are ready for takeoff, the aircraft handlers on the flight deck guide the plane onto the catapult and hook up the catapult to the plane's nose gear. On each plane's nose gear is a T-bar which pulls the plane down the catapult. This bar on the nosegear of the aircraft attaches to a shuttle protruding from the flight deck and connects to a pair of pistons in the trough. A holdback device installed on the nosegear holds the aircraft in place as tension is applied. After a final check, the pilot increases the aircraft engines to full power. When the engines are steady at full power, the catapult is fired , which accelerates the plane from 0 to 160 knots in under two seconds. On a signal from the catapult safety observer on the flight deck, steam is admitted to the catapult by opening the launching valves assembly. (The length of time the valves remain open is determined by the weight of the aircraft and the wind over the deck.) Steam surges into the cylinders, releasing the holdback and forcing the pistons and shuttle forward while accelerating the aircraft along the 300-foot deck. A 60,000-pound aircraft can reach speeds in excess of 150 mph in less than two seconds. The shuttle is stopped when spears on the pistons plunge into waterbrake cylinders. A cable and pulley assembly then pulls the shuttle back down the catapult for the next launch. Aircraft are recovered on board in a process known as an arrested landing. The goal of a landing is for the pilot to have the aircraft's tailhook engage one of four arresting wires stretched across the deck. These wires are connected to the arresting engines, large hydraulic-mechanical devices which spool out tensioned wire and absorb the momentum of the aircraft. While approaching, the speed of the aircraft is kept slightly above stall speed. When the aircraft hits the deck, the pilot immediately applies full power, in case the plane "bolters," or fails to catch a wire. This way, the aircraft has enough power to get safely airborne for another attempt. RAdm. Dennis Campbell, RN, inventor of the angled flight deck for aircraft carriers, died on 06 April 2000 at the age of 92. After joining the Royal Navy in 1925, he trained as a pilot and flew with fighter squadrons aboard three different aircraft carriers from 1931 to 1936. His experience as a naval aviator and test pilot helped him to envision the concept. The U.S. Navy was the first to implement the idea with the conversion of Antietam (CVA 36), which was completed at the New York Naval Shipyard in December 1952. In April 1953 the carrier began evaluation operations with both U.S. and British naval units, proving the worth of the angled-deck principle. Landing the aircraft at a 10-degree angle off the ship's centerline allowed the pilot to maintain a higher speed with the option of aborting a landing if the tailhook failed to engage. In Campbell's own words, "many self-inflicted near-misses and other close contacts with the Grim Reaper" enabled him to conceive an idea that would forever change Naval Aviation. The "Meatball" lights aids the pilot in lining up for the landing. In the center are amber and red lights with Fresnel lenses. Although the lights are always on, the Fresnel lens only makes one light at a time seem to glow, as the angle at which the pilot looks at the lights changes. If the lights appear above the green horizontal bar, the pilot is too high. If it is below, the pilot is too low, and if the lights are red, the pilot is very low. If the red lights on either side of the amber vertical bar are flashing, it is a wave off. The design of naval aircraft starts with the airframe and landing gear, as they must withstand a tremendous shock each time the aircraft launches or lands. Each carrier-based aircraft has a tailhook, a hook bolted to an 8-foot bar extending from the after part of the aircraft. It is with the tailhook that the pilot catches one of the four steel arresting cables stretched across the deck, bringing the plane to a complete stop. The cables are set to stop each aircraft at the same place on the deck, regardless of the size or weight of the plane. 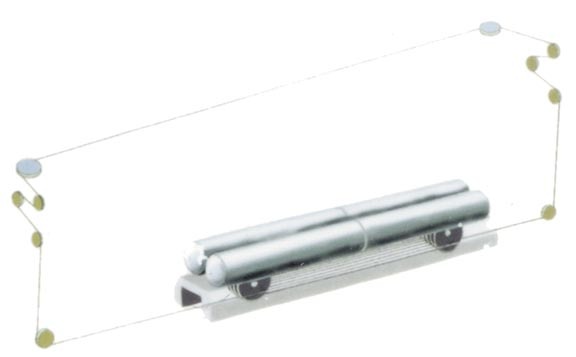 Four 1.375-inch-thick steel cables run 2-5 inches above the deck at 35-40 foot intervals and connect with a hydraulic cylinder below the deck, which services as a giant shock absorber. As an aircraft approaches, all four wires are set to accommodate that aircraft's weight. When the aircraft's arresting hook snags a wire, the wire pulls a piston within a fluid-filled chamber. As the piston is drawn down the cylinder, hydraulic fluid is forced through the small holes in the cylinder end, thus absorbing the energy of the aircraft and braking it to a stop. An arresting wire can stop a 54,000-pound aircraft traveling at a speed of 130-150 miles per hour in a distance less than 350 feet. When the aircraft drops the wire, the piston is retracted and made ready to recover another aircraft in 45 seconds. The men that work the flight deck do a remarkable job keeping aircraft in the air as well as bringing them back aboard. Flight Ops are sometimes interrupted by unforeseen circumstances that requires a fast, yet safe reorganization of the flight deck to make unscheduled launches or recoveries. To help with that organization each flight deck crew member wears a colored jersey to distinguish his function.